If you’ve ever been out to a small airport, you might have noticed that there are always a lot of pilots hanging around talking to each other about flying, and you might wonder why they aren’t just out flying instead. It’s probably because their planes are in the shop, where it seems ours spends half her time recently. To recap: In July of last year we put in a new engine. Well, three new engines. That took until late November to straighten out. Then we spent all of December pitching, un-pitching, and re-pitching the prop so it would work with Engine III. January Tess developed oil incontinence; and in February the header tank sprung a leak. Into the cockpit. Yeah, the exhaust pipe isn’t supposed to move like that. Actually, it’s really not supposed to move at all. In this case our muffler has come loose, and as it flaps around, it’s torn the carb heat connections loose, too. What does all that mean? 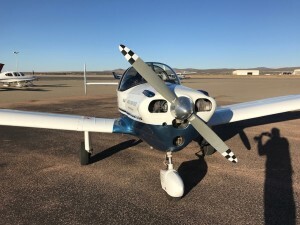 It means at least a theoretical risk of carbon monoxide poisoning for anyone in the plane when the engine is running, and a more than theoretical risk that the carb heat system will fail when it’s needed most. And those two things together add up to mandatory maintenance. And as I could see that the cowl would have to come off to work on this newest problem, it made more sense to me to move the dreaded annual up a few weeks than to pay for two rounds of maintenance within a month’s time. So off to the shop I must go, and then, because I won’t be flying for a while, I guess I’ll just hang out and talk with the other pilots. The one’s whose planes are being worked on, too. You would think she would have known better. After all, she’s had a front row seat to one airplane “disaster” after another. But noooooooooo. Despite all the best advice to the contrary, Lisa did it anyway. 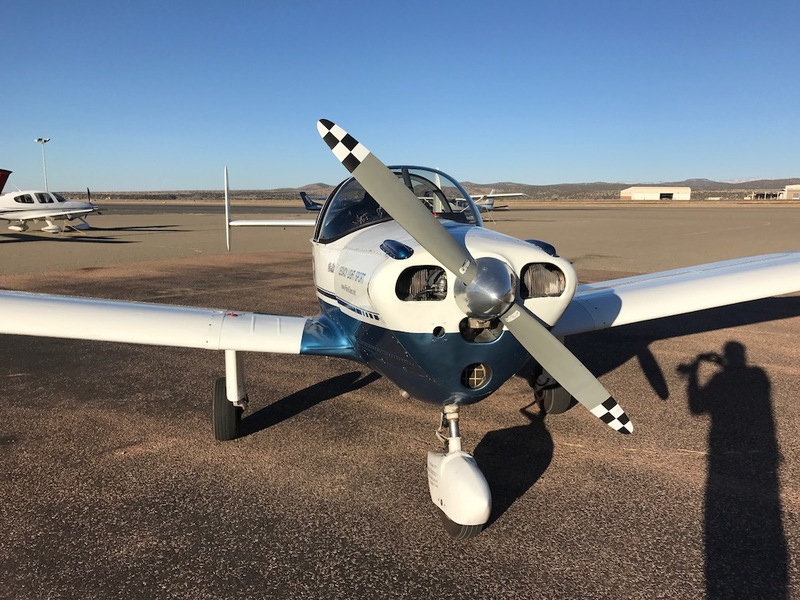 Yep, she went out a bought herself an Ercoupe. I blame myself. 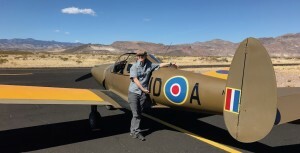 First, I showed her how much fun you can have in an Ercoupe. Then I accidently told her about one that was for sale nearby. I actually tried to dissuade her to atone for those sins, as did Rio who not so subtlety demanded, “Are you crazy? !” But, well, as anyone who’s ever flown an airplane knows: Airplanes are sirens, and sometimes it’s impossible to not answer their call. To her credit, while it might have been an impulsive purchase, she didn’t make an impulse purchase. She test flew. She had our mechanic check all the logs, airworthiness directives, and service bulletins. She got the FAA history on the plane and reviewed hundreds of scanned documents (her new-to-her plane is one of the ones that was actually sold at Macy’s!) and then she paid our lead mechanic to travel all the way across the state to do an onsite inspection. The whole process took nearly three months. Last week the entire family drove down to the southern tip of the state where she paid the previous owner and got the keys. 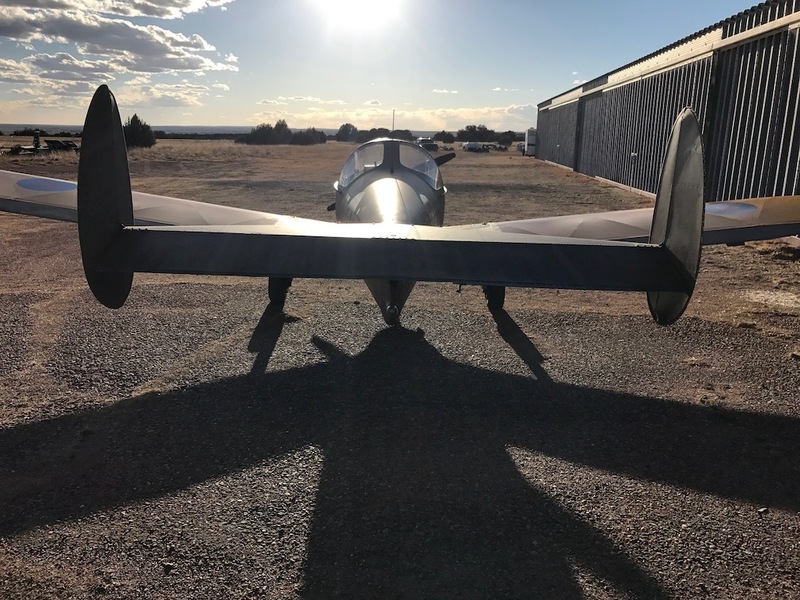 The next day, she and I ferried her new plane, named Warbler as he’s a small bird with a Warbird paint scheme, home to his new nest right next to Tessie’s. Yep. I now have a hangar neighbor at SXU and I’ll have competition for the title of President of the Airport User’s Association (previously, I had the only airplane based there). Now as anyone who has a passing familiarity with Ercoupes knows, they could be better known as Frankencoupes. Most are now in their early 70s, and have had dozens of owners over the years. In fact, in doing research for my Eternal Airplane book, I recently learned that my Tessie was quite the little tramp in her youth, having gone through 24 owners up till now. And each owner of each Ercoupe made little changes on their watches over the decades, so that now I doubt that there are two Coupes that are alike, and none look like they did the day they left their factory. In point of fact, one of the fun things about the Ercoupe Owners Club fly-ins is comparing the planes to each other. But now that there’s a second Ercoupe in the “family,” as it were, I’m finding more and more differences between the two every time I’m at the airport. For Coupe fans, here’s a quick rundown on Warbler: He has a C-85 engine, fabric wings, a single fork nose wheel, Goodyear brakes, a floor-mounted handbrake with no foot pedal, the flat windshield but enlarged back windows, the large luggage compartment, and the three-piece canopy. Like any proper Ercoupe, there are no rudder pedals. 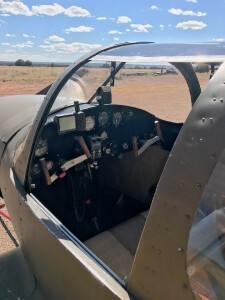 He has the early Mooney-style wood and burnished metal yokes and a nutin’ but the basics panel: Airspeed indicator, vertical speed indicator, altimeter, compass, and three engine instruments. The entire airplane has only two switches, one in the back that’s the master, and one on the panel for the nav lights. The radio is a handheld verco’d to the panel. 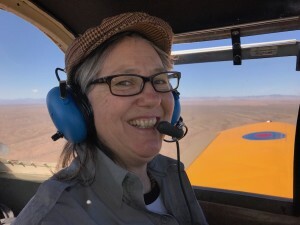 Flying home in Warbler’s right-hand seat, I couldn’t shake the feeling that I was in a 1956 Ford Pickup truck, which insulted Lisa. “He’s more like a Jeep,” she insisted. But neither trucks nor jeeps fly, and Warbler flies. And very well at that. It was a fun and easy flight, but odd in a way too. So much the same, yet so different. I kept looking for things on the panel that aren’t there, Tess being a bit more instrument heavy. Warbler’s in remarkably good shape, better by far than Tess was when we got her. 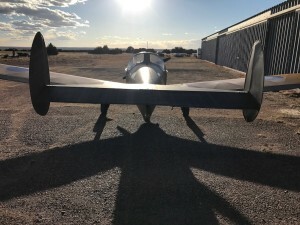 And being simple, there’s hopefully less to go wrong—although we did have an interesting fuel misadventure after taking delivery, but that’s a Plane Tale for another day. Meanwhile, I’ve got my fingers crossed that my wing woman Lisa has many happy years of airplane ownership, and fingers cross that those many happy years of ownership don’t include sending her mechanics’ kids to Harvard at her expense. And for myself, I confess that I’m looking forward to two-plane adventures in the future and I suspect that we’ll have many Planes Tales to tell in the coming years. It was colder than forecast. You can’t trust weatherman and psychics. The easy-remove blue painter’s tape did not want to come off the propeller, and I was feeling some… stress. I don’t want to remove the paint. I want it to look perfect the first time. I don’t think that’s too much to ask. Earlier that afternoon, we’d come to the hangar to deal with some electrical connection issues on the new engine monitor. I sat on a stool with my head under the cowl, my iPhone on speaker, while tech support guided me through the process of checking the wire connections. That actually worked out OK, partly thanks to the fact that we had earlier watched a YouTube video on how to use the hand-held electrical tester that we’ve owned for years and never used. It was one of those things I bought because an airplane owner is supposed to have one. The electrical gremlins subdued for the moment, the sun was getting low in the sky, and we had to zip our jackets up. We probably should have called it a day, but I was too excited about our race propeller to have the sense to wait for a warmer day to finish the job. As far as I was concerned, now that the work was done, it was time for some fun. Fun being painting the black checks onto last week’s white prop tips to finish our new race prop look. Before Rio changed his mind. I used a seamstress-style cloth measuring tape to mark the centerline of the prop, then drew a thin pencil line from the tipity-tip of the blade to the end of the white paint I applied last week. Next, I carefully lined up the first of the blue painter’s tape squares, making sure its edges lined up exactly with the edge of the white paint and the pencil line, then smoothing it firmly along its edges and lightly in the middle. I need it tight on the edges so the paint lines will be sharp and clean, but light enough that it won’t pull part of the white paint off when I remove it, which would cause me a great deal of pain and stress. The square didn’t quite reach to the edge, so I added a second piece to extend it a sixteenth of an inch or more. 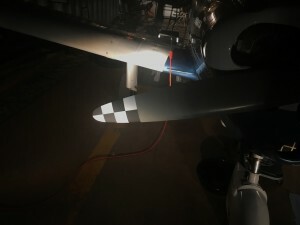 Then I applied three more squares, bending the tape around the edges of the propeller blade as I worked my way up toward the tip. Then I repeated the process on the other end of the prop. The tape masks off four squares of the white paint. When I hit the prop tips with Rust-Oleum outdoor enamel matte black spray paint, the exposed white squares will be painted black. 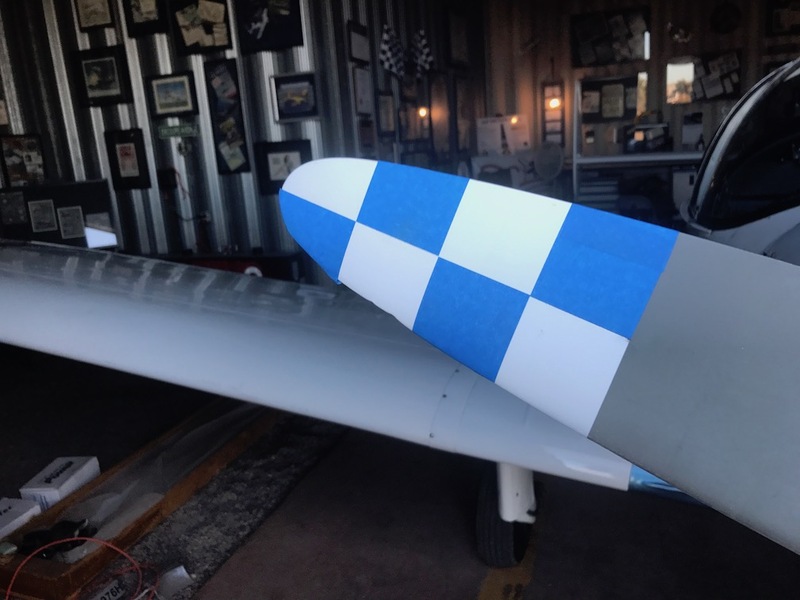 When I remove the tape, revealing the protected white squares beneath, I’ll have my very own Barnstormer Propeller. At least that’s the plan. And it won’t be an authentic reproduction. Or, well, maybe it will be. Anyway, just looking at the checkerboard pattern created by the tape, I was optimistic the final product would look good. 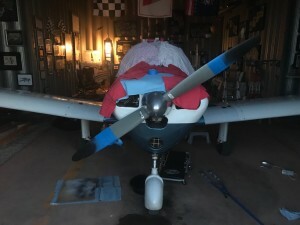 While Rio and Lisa started covering the canopy with cleaning rags to protect the glass from errant spray paint, I added a few more strips of blue tape to the prop to protect the main blade from over-spray. We buttoned up the hangar. Lisa held a large piece of cardboard behind the prop to catch the overspray and Rio held a shop light. Remembering the running paint issue from last week, I tried to go lightly. But the damn black paint is a different beast from the white paint. The can spat the paint out in large droplets, leaving a splattered look. I tried patting them flat with a paper towel, but that created a rough look. We had to wipe some of the squares off and start again. The paint dried slowly between applications. I had thought two light coats would do, as the paint is so much darker than the white, but it took three. Our feet getting cold, we retreated to the terminal building while we waited for the final coat to set enough that I could remove the tape. But when we returned, working by the headlights of my hot rod, the easy-remove blue painter’s tape did not want to come off the propellor, and I was feeling some… stress. I don’t want to remove the paint. I want it to look perfect the first time. I don’t think that’s too much to ask. I picked at the tape from the back of the blade, finally freeing a corner. Holding it between two fingers, I began to pull, stretching the tape as I went. Slowly, stubbornly, the first three pieces came off, revealing magically sharp lines between my white and black checkers. Then it happened. One of the squares took a large chunk of white paint off with it. My hopes for a beautiful Barnstormer Propeller crashed and burned.